According to Crain’s Chicagobusiness.com, the advent of the Affordable Care Act (ACA) has prompted a hospital building and renovation boom. The ACA has created a larger patient pool, and allowed for more patient choice – meaning some patients may choose new, or renovated, outpatients centers, rather than a dilapidated medical center. To keep up, many hospitals are adding outpatient centers, renovating old areas, or even starting new from the ground up. It’s high time for clinic and hospital builders, and we are here to help. Our products can be found in many hospitals, urgent care centers, and outpatient clinics. They are high quality, durable, and blend in well with most décor. The 88001 Privacy Cubicle Curtain Track is the most popular track for this application. This aluminum track has a silver satin finish and comes in six, eight, twelve, and sixteen-foot lengths, and in sections that can be straight or bent 45 or 90 degrees. Sections can be spliced together to fit large areas, and we find that these options suit almost any clinic configuration. 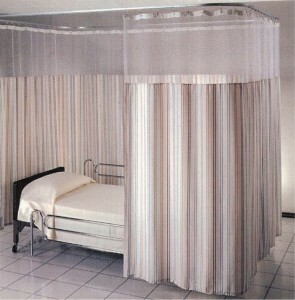 We’ve got antimicrobial curtains that can be custom-ordered with regard to color, size, and mesh. These curtains are treated with an antimicrobial agent that slows the growth of bacteria. They are a must-have in emergency and infectious disease departments. Ordering couldn’t be easier. You can fill up your cart online, or give us a call, let us know your needs and specifications, and we will make sure you get all the track, curtains, and drapery hardware you need. If you’re in a hurry we can expedite your order, and we always have Quickship curtains available to ship immediately. We keep these Oxford-fabric curtains in stock in oatmeal and cork colors, and in 84 and 96-inch lengths for builders that have an urgent need. Whether you are building a clinic, hospital, outpatient center, or urgent care facility, we have what you need. Let us be your curtain track and drapery hardware supplier. Call our knowledgeable customer service team and they will make sure you have what you need when you need it: 888-434-7444.